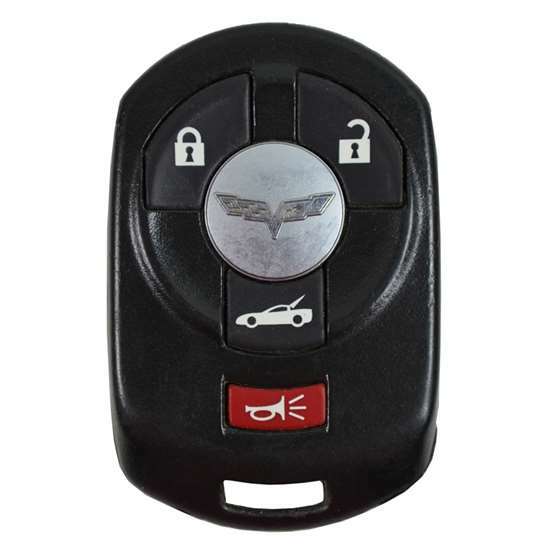 This keyless remote programming instructions work for VETTE #1 remote with part # 10372541, FCC id M3N65981403 on the back of it. ADD METHOD: This procedure will add key fobs and is not available when the maximum of 4 fobs have been programmed. New fobs will be numbered in sequence based on when they are programmed; if 2 fobs are currently programmed to the vehicle, a fob programmed using this method will be numbered as Fob 3. This procedure requires that you have a known good key fob, a replacement key fob, and the vehicle's mechanical key. If a known good key fob is not available, use the REWRITE METHOD. 1. With the vehicle OFF, open the rear compartment. 2. Place a known key fob within the interior of the vehicle. 3. At the rear of the vehicle, insert the vehicle key into the rear compartment lock cyliner, located above the license plate and cycle the key 5 times within 5 seconds. 4. The DIC will display: READY FOR FOB X (X=fob2,3, or 4). 5. Place the replacement key fob in the glove box pocket with the button facing right. 6. A beep will occur and the DIC will display: READY FOR FOB X (X=fob 3 or 4) or MAX FOBS LEARNED. 8. Operate the active portion of each key fob in order to verify correct system operation. REWRITE METHOD: This procedure erase all known key fobs and then program single or multiple key fobs. This procedure requires the you have a replacement key fob and the vehicle's mechanical key. The order in which the key fobs are programmed will determine its numbering position within the vehicle's memory. The number stamped on the key fob case is reference only: 2 can be programmed as 1. Don not place any known good key fobs in the vicinity of the vehicle when programming with this method or the programming mode will resort to the ADD method above. 2. Place the replacement key fob in the glove box pocket with the buttons facing right. 3. At the rear of the vehicle, insert the vehicle key in the rear compartment lock cylinder, located above the license plate and cycle the key 5 times within 5 seconds. 4. The DIC will display: OFF/ACC TO LEARN. 5. Press the OFF/ACC portion of the ignition button. 6. The DIC will display: WAIT 10 MINUTES then it will count down from 10 tp 0, 1 minute at a time. 7. When the counter reaches 0, DIC will display OFF/ACC TO LEARN. 8. Repeat steps 5-6 two more times for a total of 30 minutes. 9. A beep will occur and the DIC will display: READY FOR FOB 1. At this time all previously known key fobs have been erased. When fob 1 is programmed a beep will be heard and the DIC will display: READY FOR FOB 2. 10. Additonal key fobs can be programmed by taking fob 1 out of the pocket and inserting fob 2. if desired, up to 4 fobs can be programmed Once 4 fobs have been learned the DIC will display: MAX FOBS LEARNED, and automatically exit the program mode. 11. If learning less than 4 key fobs, press the OFF/ACC portion of the ignition button to exit program mode. 12. Operate the active portion of each key fob in order to verify correct system operation.